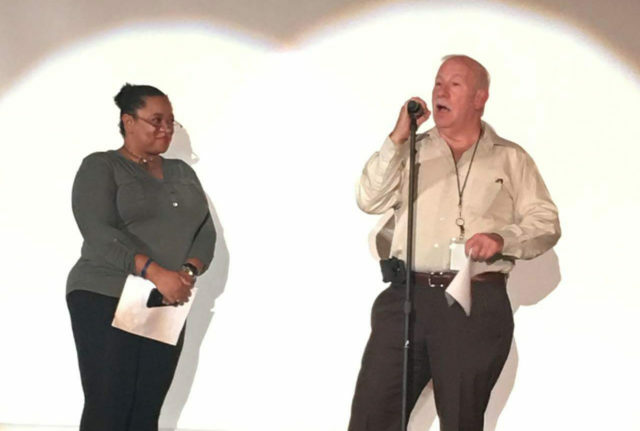 Ari McIntyre and board member Scott Schmerelson at a Millikan talent showcase, which was nearly canceled over paperwork and fees, but Schmerelson stepped in to help. Parents and teachers have become so frustrated with excessive paperwork, filing fees, and unexpected costs to use school rooms that holiday events have been canceled, fundraisers postponed, and special programs tabled throughout LA Unified. The district cracked down this fall on long-overlooked procedures meant to protect its liability, after an internal report last June showed that events held on district property without proper insurance put the district at high risk for lawsuits. So schools are being required to make sure outside groups adhere to procedures they’ve rarely been held to before. And the district counts PTA’s and parent organizations as third parties. So parent volunteers are quitting, and students are losing enhancement programs like robotics and music and cherished long-running festivals. “All of it is managing safety, and we have to deal with the issues of urban America,” said school board President Mónica García, who has persistently heard complaints from parents about obstacles from the district that are keeping them from being involved in their children’s schools. The outrage, which comes as LA Unified is putting renewed emphasis on parent involvement and grapples with a looming budget deficit, has reached school board members, who have stepped in to push the district to streamline the process for the nearly 1,200 school events proposed annually. And district officials now promise changes in coming months, including revamping web page for forms and waiving filing fees. Monlux Elementary is losing some parent involvement. • McIntyre, who runs an annual student showcase featuring dance, music, and photography at Millikan Middle Affiliated Charter in Sherman Oaks, got a bill for $78 in filing fees and $182.26 to use the space in her daughter’s school. After being called eight times by the district to pay up, her board member, Scott Schmerelson, stepped in to cover the fees. • Monlux Elementary School’s annual fall carnival in North Hollywood was canceled due to the new fees and required paperwork, and some active parents dropped out of the PTA in frustration. • The $56 fee for fingerprinting scared off an undocumented mom at an East Los Angeles magnet school, where she has volunteered sometimes as much as 20 hours a week over the past five years. Now that they’re insisting she fill out additional forms, she no longer goes to the parent center and is too frightened to even attend a PTA meeting. • A pajama party that promotes reading at Carpenter Community Charter Elementary in Studio City was hit with a $78 in filing fee and $180.50 in extra costs, and parents were referred to new bulletins outlining required procedures, forms, and a fee menu — which they said were impossible to find on the district’s website. • Unexpected fees and paperwork deadlines nearly killed an annual holiday show and postponed a performance of “Bye, Bye Birdie” at Portola Middle School in Tarzana until school board Vice President Nick Melvoin got involved by cutting through red tape. 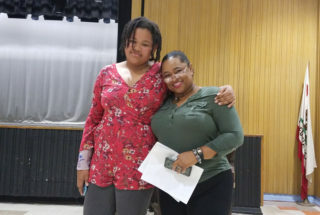 • An assistant principal had to step in to save Walter Reed Middle School’s student-run talent show this fall when parent organizers faced so much paperwork and new fees that they nearly gave up putting on the event they’ve been doing for the past decade. The rules that the district is cracking down on date back to 1992. An internal report by the district’s Office of Inspector General issued in June showed widespread duplication and confusion over the use of school sites and that procedures often weren’t followed. 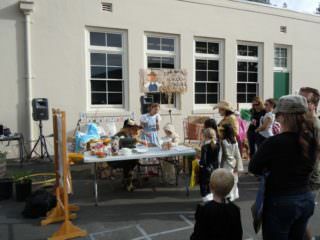 The report noted that every year hundreds of requests come from third-party groups to hold events on school grounds. The report found that the district’s Risk Finance and Insurance Branch “does not have controls in place to ensure that all requests for events” are accounted for and adequately insured, and “there is a heightened risk that an accident could occur at an event without adequate insurance coverage, leaving the district liable for damages.” The report recommended a creating a one-stop shop on the district’s website to process all permits for special events. Parent groups at Carpenter Community Charter are feeling the pressures of added paperwork and fees. But the district started imposing the procedures before simplifying the process, and that has alienated parent groups and created a precipitous drop in school events and parent involvement, according to parent activists throughout the district. Some parents are fighting the fees, which help cover custodial services. “We are parents, we know how to clean up after ourselves, and every event I’ve worked on we left the place cleaner than we got it,” McIntyre said. Ari McIntyre and her daughter Ariana. When she was charged to fill out the paperwork and use the school hall for Millikan’s showcase, she told the district she wouldn’t pay for it. She said the district’s licensing and risk management offices called eight times and asked for her auto and homeowner’s insurance to get payment, which district officials denied. In the end, Schmerelson paid the fees. Schmerelson held multiple meetings with parent groups and booster club leaders to address the confusion and insisted “that LAUSD policies on facilities use needed to be changed for certain parent-initiated school activities and, above all, that the process become more user friendly, consistent and transparent,” he said in an email, prompting the changes the district is now making. Meanwhile, across the San Fernando Valley at Portola Middle School in Tarzana, Farnaz Simantob, a parent representative, said additional fees caused an outside organization to pull its popular robotics program at the school. The annual holiday show and a performance were saved when Melvoin stepped in to streamline the process, and a district official had to approve their sets for “Bye Bye Birdie,” even though they have been the same for years. “This is a disservice to students” at a school with many low-income families, said Simantob, a parent volunteer for 12 years. She noted that paperwork has become excessive, including getting every parent volunteer to sign a waiver and fill out a form, even if they’re helping for a day. Forms can now involve different applications from various offices including food services, the Office of Environmental Health and Safety, facilities, and other departments. 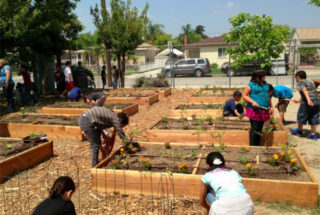 Parent volunteers help out at Valley View’s garden. 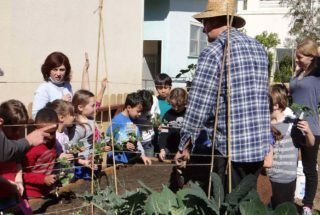 In February, the $78 application fee required for each event will be waived for PTA groups and approved parent-teacher organizations, but the fees to use the school facilities will remain, Boyajian said. She said the Beyond the Bell program and LA school police will help monitor that schools follow procedures and have proper permits and insurance. “Otherwise, it exposes us to liability, and we are doing it all for the safety of the children,” Boyajian said. The district plans to launch a new section of the Lausd.net website with a single place for every form and a checklist required for all school events that aren’t run by the principal. Luis Buendia, controller of the Accounting and Disbursements division of the district, said the one-page site will help prevent delays in getting approvals. Acting Superintendent Vivian Ekchian said parent involvement is a priority for the district. “We offer multiple opportunities for our parents to participate in their child’s education, and we are grateful for the time, ideas, and talents they bring to our schools. We are always looking for new and different ways to involve our families, and to provide a rich and dynamic learning experience for all,” she said in an email.